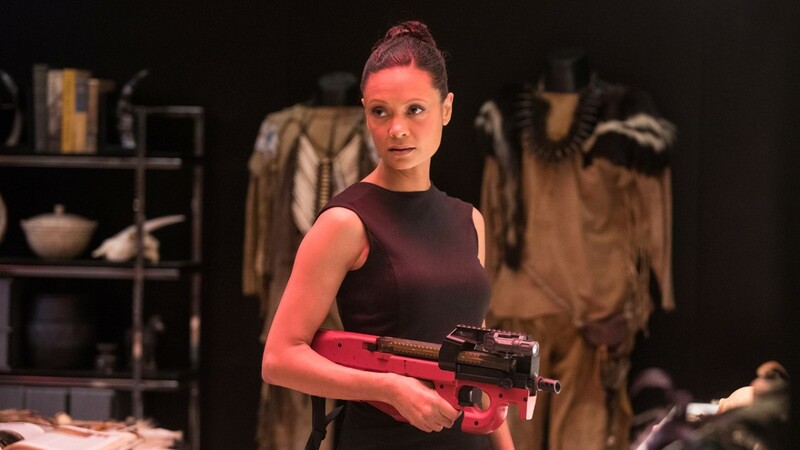 To say that episode 7 of Westworld‘s second season, “Les Écorchés,” is an action-packed roller coaster…well, I think that would be an understatement. From start to finish, we are given a non-stop (and surprisingly linear) human versus android war sequence, with bullets flying, knives piercing, and even a hand grenade blowing up The Cradle and all the host backups it contains (RIP Angela [Talulah Riley], at least for now). As we continue to settle our racing hearts after such a violent episode, we once again have pursed through the interwebs and uncovered some cast and crew interviews and videos about the episode. Let’s get started! We begin this week’s post mortem with one of the minds behind the episode, writer Jordan Goldberg, who spoke with HBO.com about what it was like to pen the war-filled episode, especially given the fact that it’s the first episode he’s written for the show. Check out Goldberg’s entire interview here. Dr. Robert Ford’s (Anthony Hopkins) return was teased at the very end of episode 6, “Phase Space,” and during the last episode we begin to understand how he plans to continue influencing the events that unfold through the chaos of the host uprising. 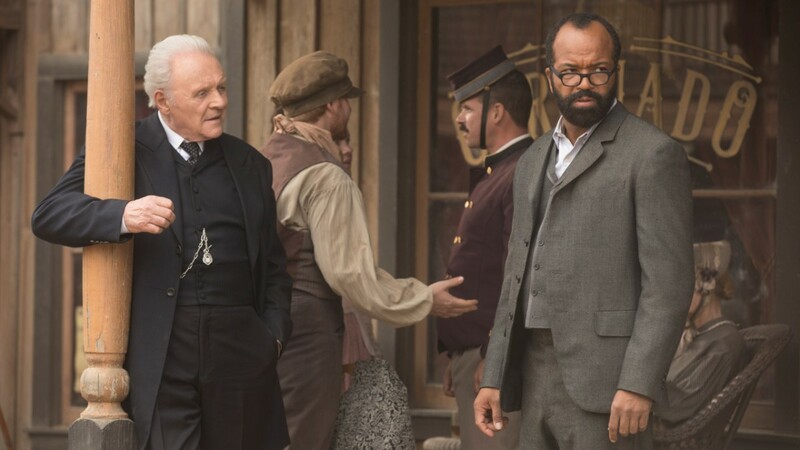 For the time being, it seems his plan is to implant himself in the mind of Bernard (Jeffrey Wright) as a way to manipulate the actions of the host. Wright certainly considers himself lucky to have been clued in to Ford’s return so early on in filming, but I have to think it must have been difficult at times to keep that huge secret for so long, especially given the fact that Ford’s return was one of the biggest questions us fans wanted answered as soon as the season one finale aired. Chcek out the rest of Wright’s interview with THR here. As we reported a couple weeks ago, Jeffrey Wright signed on to be a featured speaker at this year’s Split Screens Festival. The actor’s talk took place this past Friday, and HBO.com was there to capture the highlights! Check out the rest of the highlights from Wright’s talk here. We end our interview portion this week with a look back at the heart-wrenching farewell scene between Dolores and her father Peter. Though we don’t ultimately know the fate of Peter’s now-removed control unit and accompanying android body shell, at this present moment, it seems like he and his daughter could have spoken for the very last time. You can read through Herthum’s entire interview here. The scene above of Charlotte interrogating Bernard raises a question..
We see that Bernard answers her question about the location of Abernathy’s brain. However, we don’t hear what he says to her. Why? Then, Charlotte tells Strand what Bernard said. Or does she? Why not let everyone hear what Bernard says to her? Perhaps this was just a way to add a bit of drama to the scene. However, this is Westworld and nothing is simple. I’m not sure, but how would her voice commands be working on him anyway? They don’t work on any of the other awake hosts. If Ford is still in his brain, I think he is playing Charlotte and leading them into a trap. But I come back to my main question – why not let us hear what he said to her? I wonder if Charlotte has ulterior motives, as Barbara suggested in another thread. Corporate espionage makes sense. It’s possible. But no way will Charlotte outsmart Fernarnold! ok…. when Charlotte said “Analysis” to Bernard and asked him where Abernathy was, he did finally answer her. Then Charlotte made him answer again for the guy- I heard it both times. Did you not? No. When Bernard answers her, you see his mouth moving but do not hear what he says. Then she smiles and repeats it to those standing in the back. I’m pretty sure that we didn’t hear him say anything the first time but perhaps you are right and she made him repeat it out loud the 2nd time (rather than her repeating what he said). I will go back and watch it again. It struck me because I thought that it was an odd moment. ok…he mouthed whatever the first time and we heard the second time. the control unit is in Sector 16 Zone Four. It looked like he mouthed section 4 as his last words when I played it back a few times trying to read his lips sideways. Other than that I couldn’t tell. The worlds Section and Zone should look entirely different when said. Thanks for that info. Why would they choose NOT to let us hear what he said the first time? It is an odd choice made by the writers/director. Perhaps this was just a way to add a bit of drama to the scene. However, this is Westworld and nothing is simple. It is possible that Charlotte is not the loyal Delos executive that she pretends to be. Maybe that’s why we didn’t hear what he originally told her. Yeah, the director made an odd choice to not let us hear Peter the first time. It was either just a personal choice because that is what they thought made the best scene, or it was dropped in there on purpose for a reason. My guess is the latter. And the only reason I can think of is what Barbara proposed, and Hale somehow made Peter say the wrong location the second time to get them going in the wrong direction. Then maybe Hale will leave right after and go to the right location to steal it… because she is doing exactly what they accused Stubbs of doing, and is planning on selling it to the highest bidder? Or using it for her own purposes. I don’t know, pretty tin-foily and I’m not sure I like it. But I assume we’ll find out pretty early next time we see them; either Hale goes with Strand and Bernard, or she stays behind. If she stays behind then I bet something is up. Also, this line is a tad odd to me… Hale tells Bernard that she, “Knows its hard separating the real memories from the programmed ones.” The way she said it sort of sounded like she knew first hand. I doubt she’s a host (especially because she seemed really genuinely scared when Dolores was gonna cut her head open) and I don’t want her to be, but just some food for thought. I like this idea a lot, and I think it is pretty probable. 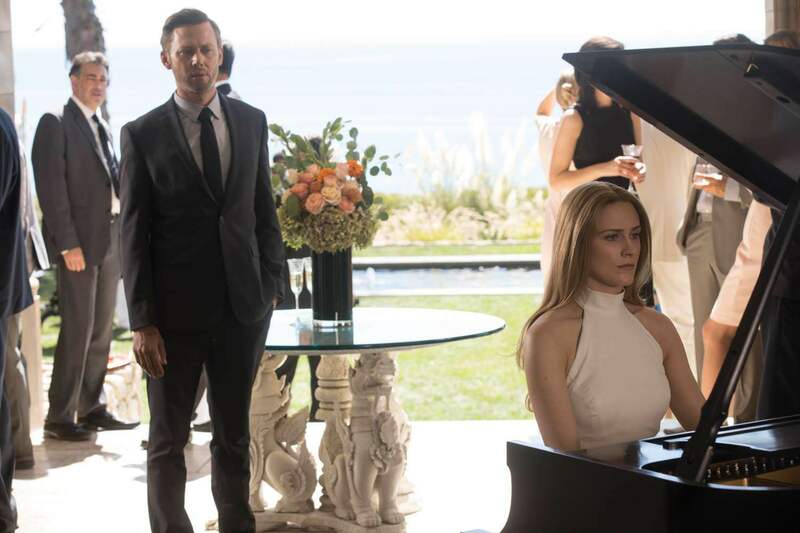 Just throwing some stuff out, but maybe Bernard is so confused on the beach and can’t remember anything because Ford has literally been in control the whole time ever since he took over Bernard this episode. How he made him kind of “black out” when Ford made Bernard shoot up all those people, maybe he had just left him in that black out state until Bernard finally wakes up on the beach days later. It would at least account for the memory loss. I also kinda feel like Ford wouldn’t let Bernard stay in the park, though. At least if all of the hosts left, I’d assume Ford would do everything he could to let Bernard have the same choices/chances that the other hosts have, and let him leave with them. Unless everything that Bernard has done so far after waking up on the beach is all apart of Ford’s plan, which would make sense if he is setting up Strand and Hale and leading them into a trap. Then Bernard can escape afterwards or something. I don’t know, all this speculating is making my head hurt. You reference Peter in the first two paragraphs. You mean Bernard, right? And Charlotte having a secret agenda may be exactly why that scene was handled that way. I’m not sure that I like it either. There is too much obfuscation in this show as it is. However, we know very little about Charlotte and how she arrived at her position so anything is possible. I don’t think that Charlotte is a host. That’s getting to be a problem with this show and it hurts the narrative. Can’t have the audience wondering if every character is something other than what that appear to be. Then the narrative becomes 100% unreliable. 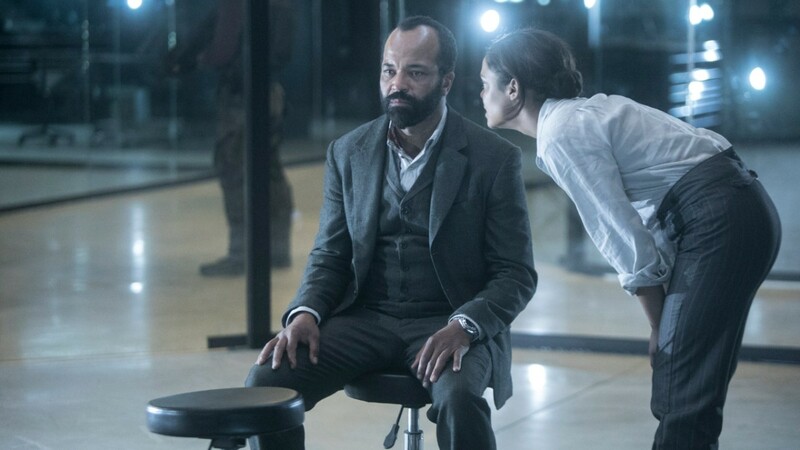 I want Bernard to be truly free at some point and not in Ford’s control. I want to see someone do the right thing. I think you might be right about Ford being in control all that time. I’m not sure what the plan is for Bernard – whether he will escape or not – but I strongly believe Ford is leading the humans back to the Valley Beyond to eliminate them. So far, the world doesn’t know what’s happening in the park (only Delos), and I’m sure Ford doesn’t want anyone finding out the truth – especially if some of the hosts are heading to the mainland. Also, the drowned hosts may be a Trojan horse of sorts, given that their brains don’t require oxygen. Perhaps they will rise up in the Mesa and take care of whatever humans remain there. Yeah, I was totally talking about Bernard. No idea why I was writing Peter Abernathy instead. And the idea of Charlotte having a secret agenda and that she’s playing Strand and Bernard is actually growing on me a bit… if they handle it well. Thinking back on the past two seasons, Ford has been miles ahead of everyone in our story, and it seems nobody can match him/ out-smart him. While I think he still is playing everyone and is still plenty of steps ahead, it might be nice for the story to have another character that is also out-smarting everyone. Kind of like Ford’s rival. I don’t know, could be a cool idea if they handle it right. Maybe she has somehow figured out that Ford is in Bernard’s head. Lastly, I also don’t like that the show seems to want us to keep guessing if people are hosts all the time. I think we can all agree that they handled the Bernard reveal last season perfectly, but they should not overuse this. Like this season, I’ve found myself questioning if William’s daughter is a host, if Charlotte’s a host, if William himself is a host. I just don’t really love it, and I hope if they do more host reveals, they really keep it to a minimum. I also hope Bernard can become free. Maybe he will end up fighting back against Ford at some point, if Ford is going to do something especially fucked up. Or, if they make it to the real world, I assume Ford will just let Bernard go, once he is truly safe. Hmmm… I never gave much thought to how the host revolution was being handled in the outside world. I kinda just assumed that if the hosts made it out alive, they wouldn’t have anywhere to hide because everyone would be gunning for them. But, if Delos kept this whole situation under wraps… then it could certainly be possible for them to blend in once they get out. If Ford can take care of all of the Delos security. I don’t know… but I’m sure we’ll find out in the next three episodes! I’m OK with Charlotte having a secret agenda, whatever it may be. However, I’m tired of the “super competent” nature of her character so, if she is doing something nefarious, I want her to fail miserably. I would love to see Bernard break free of Ford’s constraints. I would like to see him develop more of Arnold’s sensibilities and purpose. I’d like to see Stubbs contribute more and stop getting dumped on by everyone. (I would have pushed Charlotte out of that elevator!) I’d like to see Elsie get out of there and go back to dental school. And I want to see the outside world and its reaction to the ongoing massacre in the park. I don’t want everything to be obfuscation and big reveals. There has to be a narrative consistency. Its fine for the season to be building to something significant in the finale but I don’t want it to come out of left field. And I don’t think that it will. Last year, everything was set-up perfectly.